Expeditors International is a leading provider of logistics services offering its customers an international network of integrated systems and personnel specializing in efficient and cost effective movement of goods. The company is a non-asset based organization that purchases cargo space from airlines and ocean shipping lines on a volume basis and resells the space to its customers. The company was founded in 1979 by Peter Rose and James Wang in order to offer more compelling freight forwarding and customs brokerage solutions. Over the past 35 years, Expeditors has grown into one of the largest freight forwarders of goods from Asia. The principle of comparative advantage has long been a driver of international trade and this trend has only accelerated in recent decades as economic freedom has increased in many parts of the world. Depending on the nature of the goods being transported, shipping costs can be a non-trivial component of the total cost to the consumer. More trade can be justified when transportation costs are reduced. Economies of scale play a major role in the reduction of shipping costs but favorable economics can be difficult to obtain for smaller manufacturers. Expeditors provides important services that allow customers to obtain economies of scale and it does so with a capital light business model. Expeditors does not own aircraft or ships and does not compete for overnight courier business. The value proposition offered by Expeditors involves sophisticated information systems supporting efficient and reliable movement of goods in a cost effective manner. Expeditors consolidates shipments from multiple customers, obtains bulk pricing from carriers, and passes on part of the savings to customers. Expeditors offers three primary services to its customers: Airfreight Services, Ocean Freight and Ocean Services, and Customs Brokerage. Expeditors purchases cargo space from airlines on a bulk basis and resells space to its customers at a price that is lower than what customers could obtain from airlines directly. As a freight consolidator, Expeditors routes and consolidates shipments from multiple customers at the point of origin, transfers the shipment to the airline, and then breaks down the consolidated lot and arranges shipment to each customer’s final destination. Expeditors also acts as a freight forwarder of unconsolidated shipments. Typically airfreight is used by customers shipping goods with a high value-to-weight ratio. Expeditors provides similar services for ocean freight except the consolidated unit is typically a standard sized shipping container. Customs brokerage services assist customers with clearing shipments through the customs process by handling required documentation, payment of duties and taxes, and arranging for government inspections. The exhibit below shows the breakdown of the company’s 2015 net revenue (total revenue less directly related operating expenses) by the type of service provided. 2015 net revenue was $2.2 billion. Expeditors provides high value services to its customers as demonstrated by a historically healthy operating margin, defined as operating income as a percentage of net revenues. Operating margin has ranged from 29 percent to 33 percent over the past decade and was resilient during the economic crisis of 2008-09. 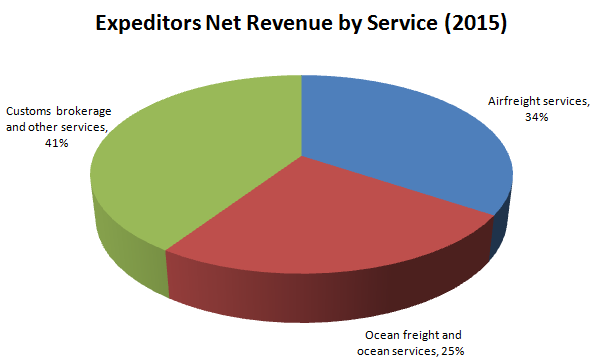 While Expeditors is not immune to net revenue declines caused by an overall decline in shipment volumes, the company appears to be able to pass through costs to its customers in a manner that maintains operating margins. Although the company pays a relatively high tax rate, net margins have also been consistent over time in a range of 17-21 percent of revenue over the past decade. As a non-asset based organization, Expeditors does not require heavy capital investment. Depreciation has approximated capital expenditures over the past decade and typically consumes between 2-3 percent of net revenue. The combination of the company’s high margins and low requirements for capital investment results in significant annual cash flow as shown in the exhibit below (figures in thousands). Over the past ten years, Expeditors has generated free cash flow of approximately $3.4 billion. The vast majority of free cash flow has been returned to shareholders in the form of dividends of $947 million and net share repurchases (repurchases less proceeds from issuance of common stock) of $2 billion. The company has been able to grow net revenue from $1.3 billion in 2006 to $2.2 billion in 2015 with very limited reinvestment. When one observes a business with favorable economics, it is important to consider whether these results are transitory in nature or the result of an enduring moat. How exactly does Expeditors generate high operating margins year after year regardless of the economic climate and overall trade volume? Clearly part of the answer has already been discussed. The mechanics of international trade are inherently complicated and are subject to scale advantages. Expeditors provides services that are particularly compelling for customers that might not be shipping enough volume to benefit from favorable rates if negotiated directly with carriers. In addition, the complex supply chain logistics necessary for efficient movement of goods can be daunting especially for smaller customers. Expeditors has decades of experience in the industry and has developed a proprietary information system that integrates with the systems of its customers. Rather than attempting to master the complexities of supply chain management internally, Expeditors customers benefit from outsourcing this function to an experienced partner. Customers end up paying less for their shipments than they would if they attempt to manage their supply chain directly and negotiate with carriers. Expeditors profits from the scale of the combined shipments it manages for all of its customers. One other aspect of the moat that is worth noting is the fact that switching costs could be relatively high for the company’s customers. This might not be intuitive because switching shipping vendors does not seem, at a surface level, to be that difficult. However, integration of the company’s proprietary information systems with those of its customers certainly creates switching costs in the long run. In addition, as long as service is satisfactory, customers would have little incentive to change their supply chain radically and risk disruptions that could be very costly to their end customers. Inertia resulting from a satisfactory status quo situation can be very powerful. All of this gives Expeditors pricing power and preserves its moat. Furthermore, the moat should strengthen over time as Expeditors continues to grow and benefits from even greater economies of scale. 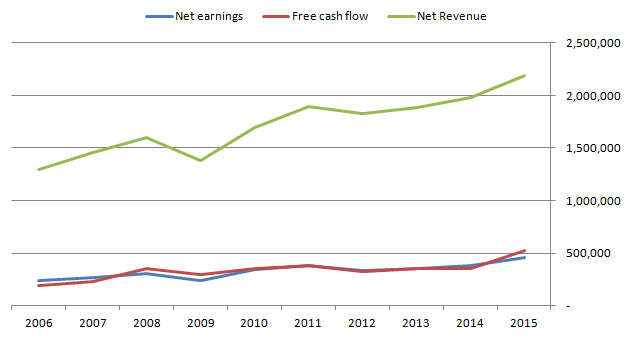 Expeditors has historically traded at relatively high multiples of earnings and free cash flow. The favorable economics noted above have not been lost on market participants. However, over the past decade, the company’s valuation has declined significantly. Earnings per share increased from $0.98 in 2005 to $2.40 in 2015 which corresponds to annualized growth of 9.4 percent. However, the share price has made little progress over the past decade. Expeditors does pay a small dividend but overall shareholder returns have still been unsatisfactory. At the current share price of $48, Expeditors trades for approximately 20 times earnings which is far lower than the multiples that prevailed ten years ago. Part of this might be due to the company’s margins being higher than average in 2015 but it is likely that continued growth will result in steady, albeit irregular, increases in earnings power over time. If Expeditors can grow earnings at 9 percent over the next decade, earnings per share should be $5.50 to $6.00 by 2025. The current multiple is not outrageously high in light of likely earnings growth. Expeditors still has a relatively modest market share so it should be able to grow in excess of overall trade volume growth. With a capital light business model, Expeditors can be expected to return the vast majority of free cash flow to shareholders either in the form of dividends or share repurchases. To the extent that share repurchases continue to dominate as a means of capital return, continuing shareholders benefit from a more reasonable valuation since the share count will decline more quickly. Expeditors may not qualify as a deep value stock but the valuation does not appear unreasonable especially for investors with a time horizon exceeding three to five years. It is worth noting that the current political environment in the United States is arguably the most hostile toward international trade in many decades. As The Economist noted in a recent article, the political tide seems to be turning against free trade despite the many clear benefits that have, in the past, attracted widespread bipartisan support. Candidates from both political parties have turned against free trade with the Trans-Pacific Partnership (TPP) attracting withering criticism. It seems likely that the next administration will be much more reluctant to enter into free trade agreements and could very well seek to roll back trade using various protectionist policies. Whether such policies would merely slow the rate of growth of international trade or actually result in a decline cannot be predicted with any certainty. However, we can be relatively certain that scary sounding headlines with respect to trade will appear with regularity over the coming months. These headlines are likely to affect market sentiment for publicly traded companies perceived to be impacted by the volume of international trade. The intrinsic value of companies like Expeditors could very well be impacted by government policy to varying degrees. Market reaction, however, will probably not be driven by a sober assessment of the actual risks and likely impacts. Instead, it is likely that any company thought to be exposed to trade will be sold indiscriminately by short term market participants. This could create buying opportunities for alert value investors with a longer term time horizon. Disclosure: No position in Expeditors International. Why Is Todd Combs Bullish on Western Union?